Don’t even think about eating breakfast/brunch anywhere else. 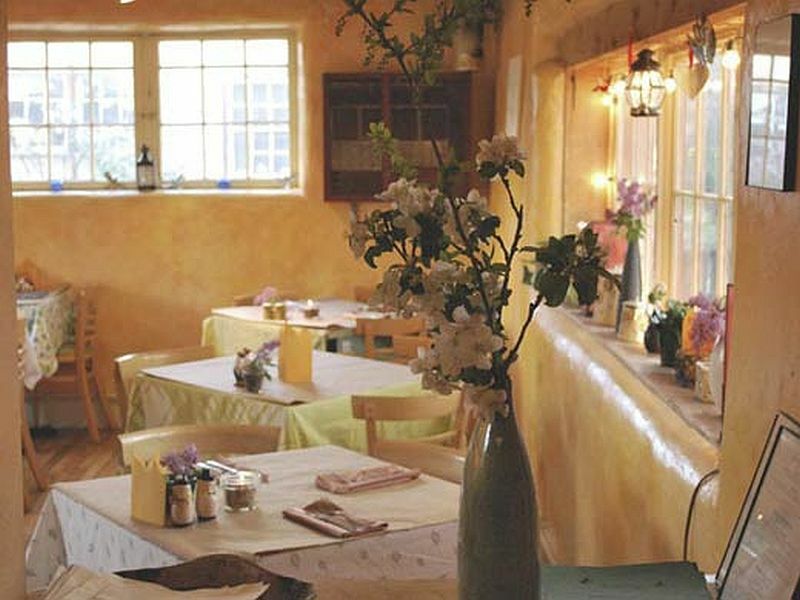 The Dragonfly Café and Bakery is a European-style café and bakery located in the heart of historic Taos, New Mexico. Chef and Owner Karen Todd instinctively creates unique and inspired menu items that combine homemade flavors with exotic flair. She does it right. We visit our dear friends Sally and Andy Wasowski, who live north of Taos on a mesa top, as many times each year as our (and their) schedules allow, and invariably have at least one meal at Dragonfly with them and assorted guests. I have never had anything there that was less than great. Karen prepares specials made from whatever catches her eye when she shops. Last winter she bought a mess of liver, and on a cold, wintry night when we were there, turned it into one of the tastiest dishes I’ve had there. 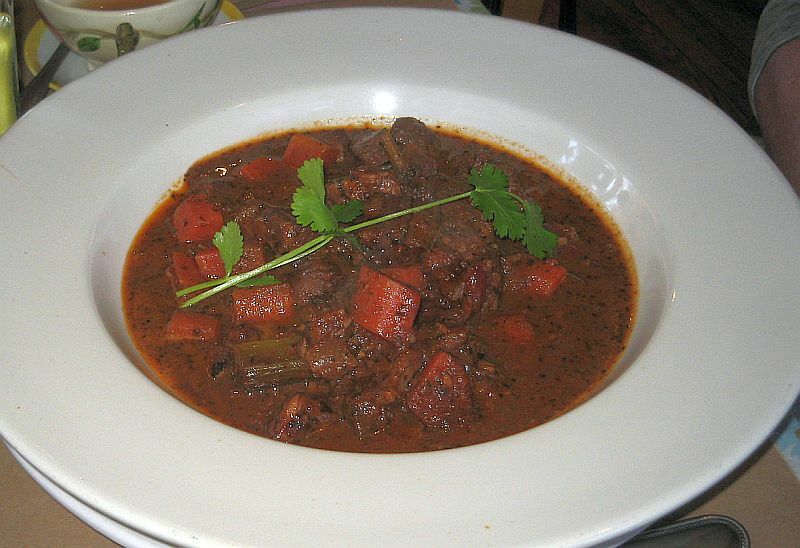 Gently sauteed morsels of very tender liver in a lovely port wine reduction served with a velvety risotto, this dish returns liver to an exalted place on the food medalist list. “Liver,” you cringe? “Exalted?” “Darn right, it ain’r your granny’s cardboard imitation,” I retort. Trust me. Superb dish. 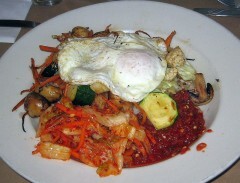 I reminded her recently at brunch one Sunday about this dish. She allowed that if she decides to do it again some cold winter day, she will tell Sally and Andy, they will tell me, and I will make a special trip from Corrales just for this meal. 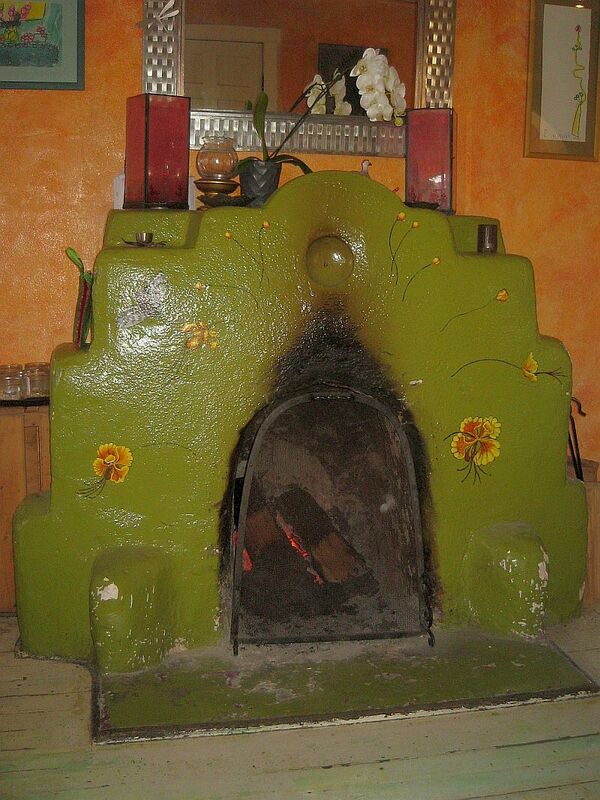 The Dragonfly Cafe & Bakery occupies a 1920’s bungalow style adobe originally home to the Tarleton family. The Tarletons tended gardens, livestock and an orchard on the back of the property. For 20 years, it was home to Dory’s restaurant, host to many local artists and writers. 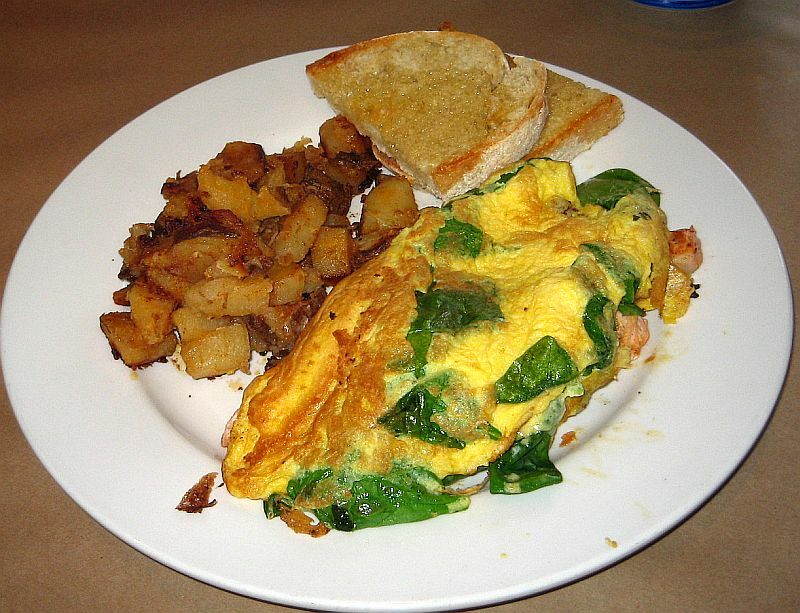 Founded in 1998 by Chicago native Karen Todd, The Dragonfly Cafe and Bakery is the result of Todd’s 20 years of experience in restaurants and bakeries. Todd also spent several years traveling the world familiarizing herself with many types of cuisine, influences now reflected in today’s menu. The Dragonfly Cafe is committed to providing the highest quality ingredients, procured locally and organically whenever possible. All of the dairy and non-cured meats are hormone and antibiotic free, and all of our baked goods are made in-house using local organic flour, the highest quality sweet cream butter and natural sweeteners. Taos Roasters supplies the Dragonfly with organic fair-trade coffee, and the local Rasband Creamery provides RBGH free dairy. Bison Burger. If you think that Bison Burgers are tough, dry, and tasteless, you have been going to the wrong places. 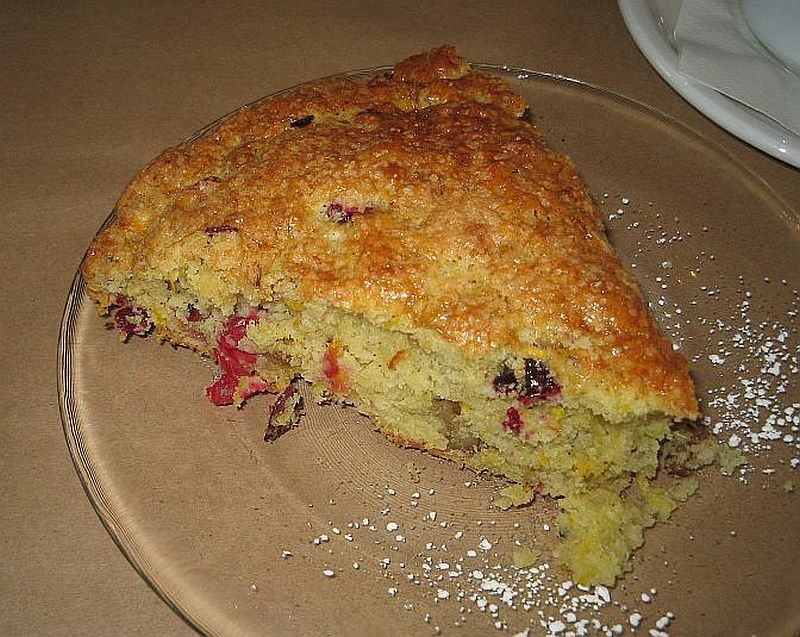 You need to try this excellent creation at Karen Todd’s Dragonfly Cafe & Bakery in Taos. This is a large and very tender patty cooked to your specification — medium rare for me, which maximizes the taste and the juiciness. Served with expertly caramelized onions and blue cheese on organic foccacia, it is one of the very best burgers you will find anyplace near Taos. Juicy? Dripping from your chin juicy. Three napkins juicy. It is accompanied by a small salad of organic mixed greens that have been lovingly dressed with a daily vinaigrette. Try it. You will be disabused of the lie that bison is tough and dry. This, like everything else at Dragonfly, is among the best food in a town usually known for its substandard tourist fare. Yeah, gumbo. Right here in northern New Mexico. 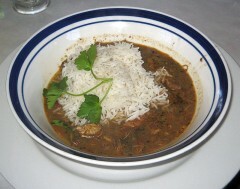 Gumbo is a stew or soup that probably originated in southern Louisiana during the 18th century. It typically consists primarily of a strongly-flavored stock, meat or shellfish, a thickener, and seasoning vegetables, which can include celery, bell peppers, and onions. Gumbo is often categorized by the type of thickener used: the African vegetable okra, the Choctaw spice filé powder (dried and ground sassafras leaves), or roux, the French base made of flour and fat. The dish likely derived its name from either the Bantu word for okra (ki ngombo) or the Choctaw word for filé (kombo). Karen’s version is flawless. Closest gumbo to Cajun country that I have yet found in New Mexico. Beef simmered with winter vegetables in a Dijon red wine broth, served with house made organic bread. Yeah, your mom made this too, but it was probably not French country style. Most likely something made from leftovers. And then Dinty Moore gave beef stew a bad name. Karen to the rescue. Hers is a simple dish, nicely herbed, with just-right root vegetables in the thick broth. 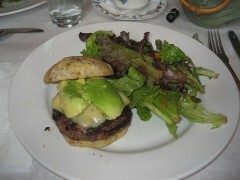 I really want to eat this by the fire with a raging snowstorm outside (this does happen in Taos). Creamy organic chicken and vegetables topped with flaky butter pastry. 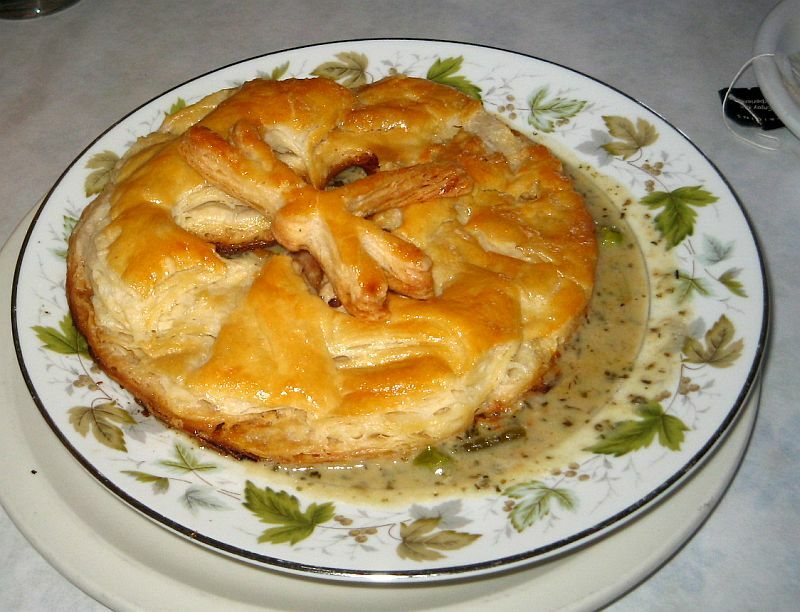 Everybody’s mother made chicken pot pie, usually with leftovers. Then we all got lazy and began to pick them from the freezer case in the local supermarket. Shame on us. Karen will restore your faith in that humble dish. Her version is creamy, properly herbed and spiced, and topped with a flaky pastry rust that only a master baker can fashion. There is even a pastry medallion in the shape of a dragonfly atop the crust. You won’t find this in Trader Joe’s. Southern style black-eyed peas with southern style greens and poached eggs on corn bread, topped with a roasted red pepper sauce. A specialty of the house for brunch is Eggs Dragonfly — a signature dish. I guess that I have had this unusually wonderful dish at least a half-dozen times. It always amazes me. 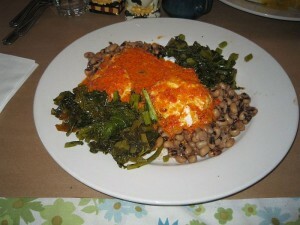 This is Karen’s take on soul food, and you would not expect this delicious soulful combination of foods to be served in Northern New Mexico, home of amazing chile cultivars. It’s every bit as good as anything I have breakfasted on in the Deep South. Eggs Benedict. House made English muffin opped with ham, poached eggs and hollandaise sauce. Sure, you can get Eggs Benedict almost anywhere — this is one of the most popular brunch dishes in existence, and rightfully so. But Karen’s version is better that most others. Simply superb. 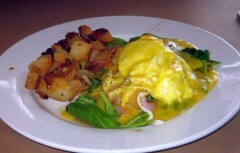 The Hollandaise is silky smooth and has that really wonderful mouth feel. Make sure to ask for the eggs to be poached “really runny,” and you will be rewarded with egg velvet in your mouth. The potatos are unassailable. If you like, spread some of the egg yolk-Hollandaise mixture on the potatos. A real taste treat. Trust me. Karen prepares several omelets for Sunday brunch. Our choices were salmon (which is great—I’ve had it several times) or pork sausage, which is new to me. This is made with fresh pork sausage and green chiles with avocado and some gentle herbs. A large omelet, it was perfectly cooked, and neither too dry nor too wet, but just right. 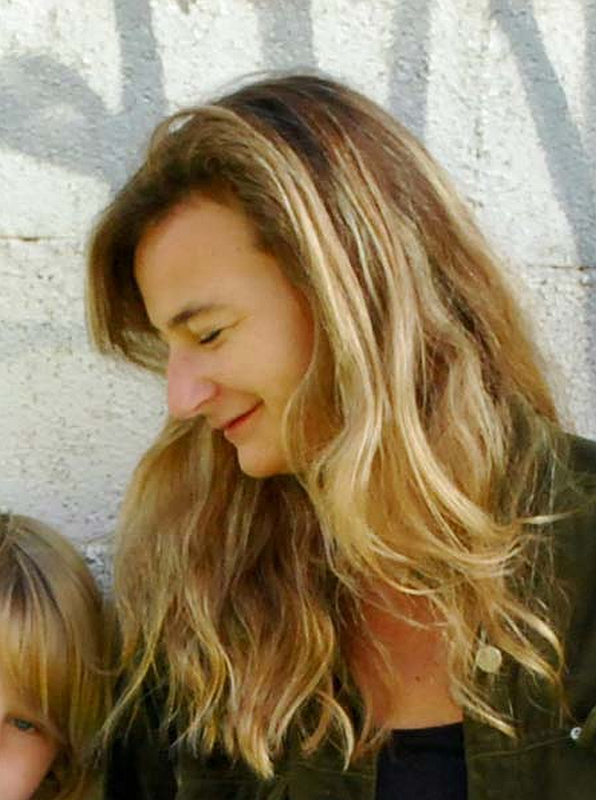 Goldilocks surely would have loved it. The home fries completing the dish were just crispy, and very tasty. Again, neither soggy and pasty nor hard and dry, but just right. You need to ry her omelets. Fantastic. 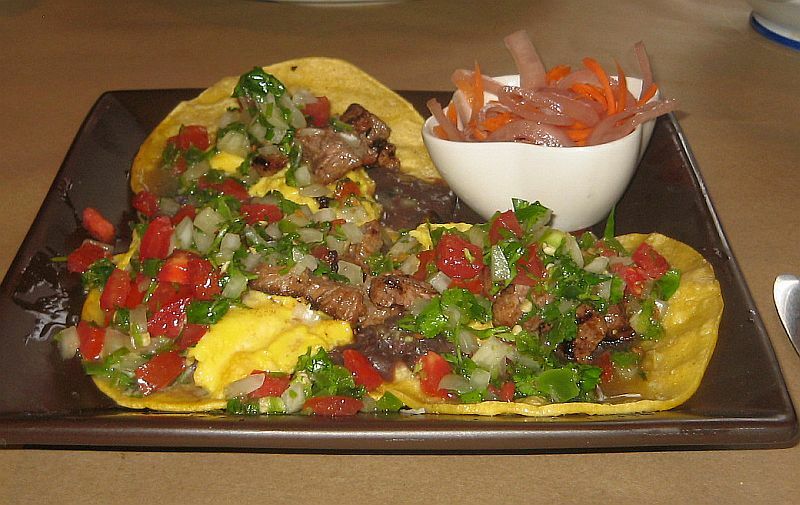 Steak and eggs scrambled topped with black beans, pickled onions and jalapenos, ciklantro and salsa. Not all tacos are like those Tex-Mex abominations, which are more often than not greasy and overspiced with “taco seasoning” from Sysco, with jalapeños being the sole source of interest. This inventive dish is a welcome addition to Mexican-inspired breakfast tacos. 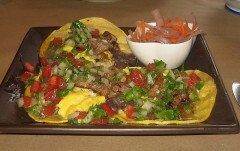 Good eg and steak mixture, nice beans, and a very tasty salsa adorn three soft tortillas. This is fork food, not hand food. I would drive to Taos just for this breakfast. 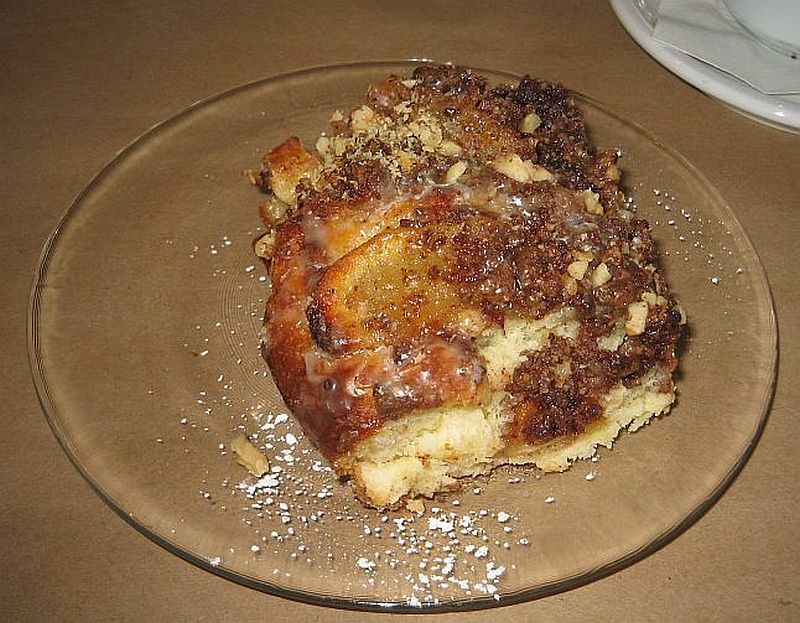 I am an unashmed bread pudding freak, an affliction I share with my friend Gil Garduño, New Mexico’s Sesquipedalian Sybarite. He told me about this bread pudding, and suggested that it would earn a place on my Bread Pudding Hall of Fame. It did, rocketing to the top of the list, above some pretty stiff competition. This is a blueberry-white chocolate masterpiece with a flaky pastry crust atop the silky smooth slightly custardy pudding. One bite, and I heard the celestial voices throughout the room. This is the most delicious bread pudding that I have had anywhere. 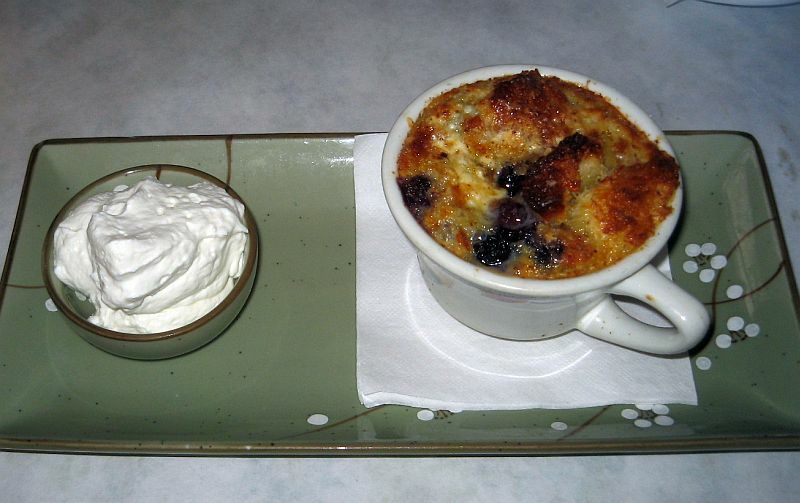 Curious that the two bread puddings at the top of the list are both served in Taos. Must be the mountain air. Sally and Andy eat there at least three times each week. The Sunday brunch is not to be missed. Don’t even think about eating breakfast/brunch anywhere else near Taos. And the pastries and other bakery goodies will amaze you. This is the very best bakery in Taos, and possibly anyplace in Northern New Mexico. The scones are sinfully delicious. The only better scone that I have had in New Mexico was at the Gold Street Caffe. That’s pretty far piece away. If I lived in Taos, I would eat here at least three times a week. It’s that good. 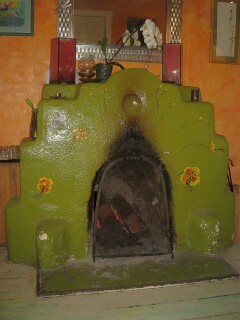 This entry was posted in Bakery, Breakfast/Brunch, Closed, French, Indian, New Mexican, New Mexico Top Ten, Taos. Bookmark the permalink. 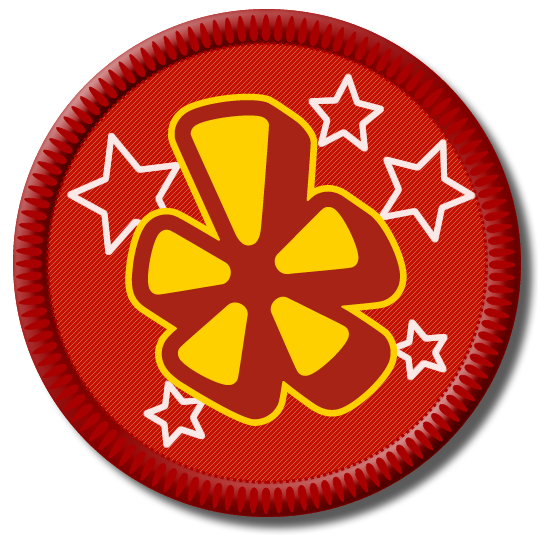 Outstanding recommendation, Larry! 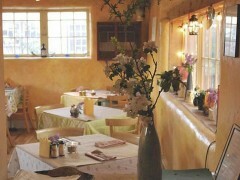 The Dragonfly Cafe & Bakery is a real gem, one of the most exciting and fun restaurants in Northern New Mexico. The bakery certainly is without peer–much better than the bakery at Michael’s just down the street. You’ve got to try Dragonfly’s white chocolate and cherry bread pudding. It just might make your top five list. Made it to the top. Thanks for the suggestion, Gil.